Winter winds, sunny days, central heating and even clothes themselves draw the moisture out of the skin. This delectable lotion - enriched with softening natural oils - not only relieves the itchiness and irritation of a parched body, but leaves it velvety-textured and subtly scented. Keep skin safe and supple with a full body service. This silky smooth lotion brings together the most moisturising herbal extracts including jojoba, evening primrose, aloe vera, mahonia and shea butter to protect and maintain soft and supple skin, while French lavender, chamomile and orange blossom combine to create a calming aroma. Think of it as sheer body heaven. 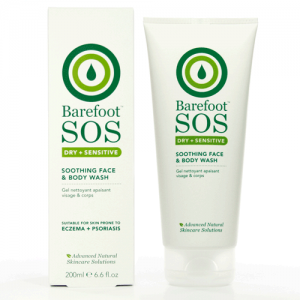 Designed as a daily maintenance product for those with dry skins. It does not replace the SOS Rescue Me Face & Body Cream but acts as an adjunct. Suitable for those prone to Eczema & Psoriasis. Mallow, Mahonia, Calendula: Soothing and healing herbs, Liquorice Shea Butter: Emollient and Soothing for hypersensitive skin, Aloe Vera: Soothing & Healing, Vitamins B5 & E: Healing, soothing vitamins, Jojoba oil: Packed with essential fatty acids to help the skins integrity, Essential Oils: Lavender, Neroli, Chamomile, Benzoin. Pamper you skin by applying this daily. For a real moisturising treat, apply a thicker layer of lotion to absorb at night whilst your skin regenerates as you sleep. Barefoot Botanicals Secrets for Better Skin: Stressed skin (eczema/psoriasis) comes from within. Achieve inner balance with yoga, meditation or massage and a diet rich in vegetables, oily fish, fibre (to eliminate toxins & waste) & plenty of water. Contact a local professional homeopath for holistic healing of skin problems.